Something that’s so great about the Adirondack Coast is its ability to provide fun outdoor adventures for all ages no matter the season – and fall is no exception! While summer showcases our diverse water recreation opportunities, like paddling, fishing and windsurfing (and, trust me, Lake Champlain provides challenging opportunities for all three! ), it’s the autumn months that truly allow our agriculture experiences to shine. Farms come alive as visitors explore petting zoos, pumpkin patches, farmers’ markets, historic farm museums, and – of course – apple orchards! In fact, Clinton County, one of the largest apple-producing counties in the country, is home to the world’s largest McIntosh orchard. Plainly put: welcome to apple country. But apples are just the start. This season, I decided to drive from Peru to that famed McIntosh orchard in Chazy plucking autumn’s most prized fruit right from the trees along the way… and finding other tasty treats in the process! My friend Will, who you might remember from last year’s spooky spots feature at Macdonough Hall, came along for the ride – and the cider doughnuts. 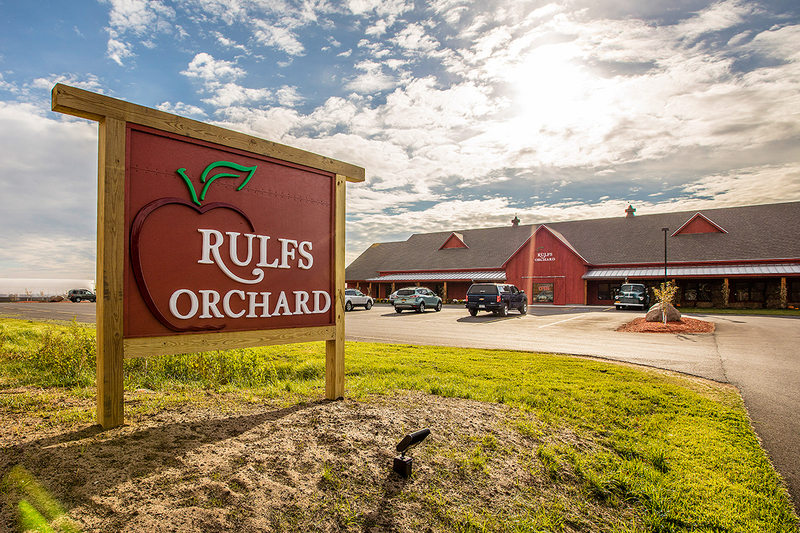 We started our journey in Peru at Rulfs Orchard, right off of I-87 Exit 35 on Bear Swamp Road. This orchard’s brand-new building allows it to truly showcase its variety of agriculture offerings, going way beyond just apples. In fact, though it’s considered one of the most popular U-Pick apple, pumpkin and berry spots on the Adirondack Coast, it started out as just a small family dairy farm in the 1950s. Rulfs now operates a deli in their new building (with a drive-thru!) offering breakfast and lunch menus full of yummy sandwich options. After lunch, you can grab a treat from the bakery – like their famous apple pies, now served in individual sizes. And if you’re going to have an apple pie, you might as well have some apple cider too. I happen to think theirs is some of the best around! Still in Peru, we headed to Northern Orchard Farm Stand next. Here you can find apples among a variety of seasonal veggies, like squash, corn, pumpkins and more – right off the side of Union Road. Just look for the fun colored flags! On the Adirondack Coast, we’re known for our agriculture, outdoor recreation and history. As you explore our attractions, it’s common for these strengths to overlap, creating one complete and exciting experience. This is the case with Northern Orchard, which happens to be located on one of two spots in Peru designated as sites along the Underground Railroad. In fact, spots like this throughout the Champlain Valley, a region shared by New York, Vermont and Quebec, were some of the last stops for many slaves en route to freedom in Canada, just across the border. Our final stop in Peru was Applejacks Orchard. Here, visitors can pick their own apples or grab a bag from the store among other country goodies. Like many orchards on the Adirondack Coast, Applejacks offers mesmerizing views of New York’s Adirondack Mountains and our area’s plentiful rolling farm hills. But unlike other orchards, Applejacks boasts what they call their “Mystery Apple”. About a decade ago, the orchard’s owner, Jim Murray, planted a number of trees and tagged them with a metal flag; within this order of apples he received samples for other varieties, which he planted nearby. Several years later, the trees were bearing, but the metal sign was missing. There was no telling which trees were which, and they were all mixed together! To this day, it’s still a mystery. But one thing is certain – those mystery apples are pretty tasty! Continuing our scenic drive from Peru to Plattsburgh, we hopped on Route 22B and headed to Banker Orchards, where we ran straight for the trees. Like Rulfs and Applejacks, Banker is another one of the Adirondack Coast’s U-Pick orchards. Doughnuts are a fall fave, for sure – and sugar-dusted apple cider doughnuts are Banker Orchards’ specialty. They bake them fresh on site! The baked treats are located right in the country store adjacent to the orchard, petting zoo and fun outdoor games and activities for kids. Well, okay – I use the term “kids” loosely. 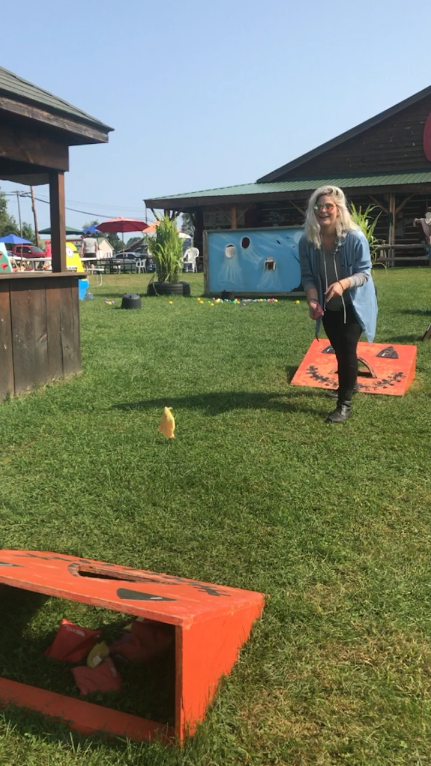 Either way, there’s plenty to check out at Banker Orchards, no matter your age or maturity level. After we had our fill of doughnuts and games, we piled back into the car (which was pretty packed with orchard goodies at this point), and made our way from Plattsburgh to Chazy where we would finally encounter “The Largest McIntosh Orchard in the World” at Chazy Orchards. I think you can guess what’s unique about this place! Visitors can venture into the orchard on their own for U-Pick or they can purchase a range of bagged apples from the store, including SweeTango™. This special hybrid variety of apple created in 2009 that’s only produced by licensed growers. Pretty fancy! Want to add some variety to your Adirondack Coast getaway? Pick one or two of the orchards listed above and check out these other nearby attractions.